Sitting around last night, Mrs CWG and I decided that we needed to coif a Burgundy and looking through our wine database we settled on trying the 2002 Joseph Drouhin. For those that know me know that I am more of a Bordeaux man, in fact there was some thought put into naming this the canadianbordeauxguy blog (but darned if that isn’t a mouthful!). Burgundy’s to me have always been a secondary choice. Of late though I have started to dive into them with great attention and this Drouhin win is no exception. If you are shopping for Burgundy reds it is not hard to find a plethora in the $30 to $60 range, this will lead to a great deal of pondering, searching or simply reading labels and hoping you are buying there right one. A hint for purchasing a Burgundy red blind look for a Grand Cru or Premier Cru as you will probably be getting a top tier wine. They are pricier but if you are spending $30 what is an extra 8-15 to get a Premier Cru? This wine in question is neither a Grand or a Premier but when buying it I was pretty confident of the quality, Drouhin is a large producer and I have had some of his other Burgundies before. The Drouhin site is one of the better websites for understanding the producer and drilling down to the details of the wine, it is very much worth reading. Enough on that, let’s move on to the tasting! Removing the cork and decanting created the first split view between Mrs CWG and me in a long time. She simply did not like the smell, referring it more to the “sewer” portion of the aroma wheel where I quite enjoyed it and got more of a deep raspberry with a bit of a smokiness. Once the first few slurps were done Mrs CWG’s viewpoint changed dramatically. Raspberry with blackberries, vanilla and oak are very predominant here. The wine is a tad soft to start but finishes with a bit of oomphf. It is a good representative for a Burgundy, well rounded enough to please with soft and subtle tannins. To say this was easy to drink is an understatement, the wine disappeared before we knew it. I think that $39 is a tad much for this though when it comes down to it, but overall we enjoyed it, and that is what drinking wine is all about. The subjective rating of the day for this wine was 88 out of 100. Good, enjoyable, nothing to write home to ma and pa about. Mrs CWG wants to know where all the wine went so fast! late edit: This wine could continue being cellar for at least 3 to 8 years, I missed that this morning! 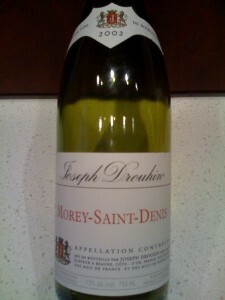 This entry was posted in Burgundy, Wine and tagged Burgundy, canadian wine guy, joseph drouhin, wine review. Bookmark the permalink.